The Presbyterian Mission Agency has created a scholarship fund to honor the name and legacy of the late Rev. Dr. Katie Geneva Cannon, a pioneer and legend in the Presbyterian Church (U.S.A.). Dr. Cannon succumbed to leukemia Aug. 8. 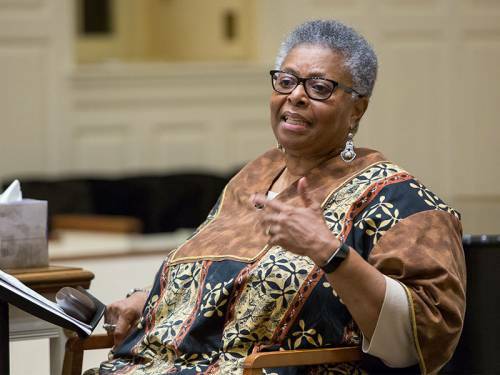 Cannon, a leading voice in the subjects of womanist theology and women in religion and society, was a renowned lecturer on theological and ethical topics and the author or editor of numerous articles and seven books, including Katie’s Canon: Womanism and the Soul of the Black Community and Black Womanist Ethics. The scholarship, the Women’s Ministry Fund (E049991), is a fund of Racial Equity and Women’s Intercultural Ministries at the Presbyterian Mission Agency and has been established for women of color to attend leadership development events. The Women’s Ministry Fund supports Presbyterian women of color, clergywomen, college women and other women with opportunities for leadership and spiritual development as well as mission opportunities in the PC(USA). “The Rev. Dr. Katie Geneva Cannon is an important part of the landscape and contemporary history of the Presbyterian Church (U.S.A.),” said the Rev. Dr. Rhashell Hunter, director of Racial Equity & Women’s Intercultural Ministries. Almighty God, please continue to guide us as we seek to nurture the next generation of community and religious leaders — leaders committed to vibrant and revitalized life. Amen.